Insertion and Removal of Contact Lenses When you first start wearing your contact lenses, it’s a good idea to insert and remove your lenses over a dark towel spread on the counter. If you drop your lens, it is easy to see against the dark color of the towel, and the towel may protect the lens from nicks or tears. You may need to use the mirror at first, but once you get the hang of it, try to practice inserting and removing your lenses without a mirror. The reason for practicing this is that you may not always have a mirror available when you need to work with your contact lenses.Keep your fingernails trimmed short and smooth in order to avoid damage to your lenses or injury to your eye. Always wash your hands before handling your contact lenses. Use an anti-bacterial soap, rinse thoroughly, and dry with a lint free towel.Do not use soaps with creams, deodorants, or perfumes. They may leave a film on your hands and cause eye irritation. 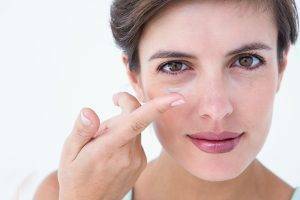 Avoid using lotion or oily cosmetics, as these substances may come into contact with your lenses. Be sure that your fingernails are trimmed and smooth to avoid damaging the contact lens or scratching your eye. Always start with the right lens to avoid switching the lenses by mistake. Rinse the lens thoroughly with saline or rinsing solution. Check lens carefully for debris or nicks on the lens. Make sure the lens is right side out. To do this, hold the lens on your finger and look at the edges of the lens. If the edges appear straight up, and the lens looks bowl shaped, it is right side out (figure 1). If the edges of the lens are slightly flared, it is inside out (figure 2). Your lens may have inversion marks to help determine if the lens is right side out. If the letter or mark can be read by looking at the lens, it is right side out. If the letter or mark is reversed, the contact lens is inside out. Hold your upper eyelashes to prevent blinking with the hand not holding the contact lens. Place the middle finger of the hand holding the lens close to your lower eyelashes and pull down the lower lid (figure 3). Bring the lens toward the eye while looking straight ahead, as if “through” the lens (figure 3). Place the lens gently on your eye.Before releasing your lids, pull your index finger away from your eye and look to your right, left, up and down. This helps remove the bubbles that form under the lens and makes the lens conform to the front surface of your eye. Gently release the lids and blink to center the lens.Use lubricating or re-wetting drops if your lens feels dry. Repeat the procedure for the left lens. Wash your hands with antibacterial soap. Dry your hands with a lint free towel. Pull the lower lid down with the middle finger of your inserting hand. Move the lens downward onto the white part (sclera) of your eye, with your forefinger, as you look up. Gently pinch the lens between your thumb and forefinger (figure 4). Remove the lens from your eye. Is the lens clean? Oils or cosmetics on the lens will cause the lens to be blurred. Is the lens on the correct eye? Are there nicks or tears on the lens? Sometimes what appears to be a crease or line in the lens is actually a tear. If there are any defects in the lens, do not wear it, because you could cause an injury to your eye. Please call our office if you experience any problems or have questions. Proper lens care is necessary for successful lens wear and to optimum eye health. Make certain to follow all instructions carefully. Remove your lenses if you notice any pain, redness, swelling or cloudy vision. Discontinue lens wear and contact our office. It is normal to feel some sensations such as itchiness or fuzziness at first. Allow your storage case to air dry each day.